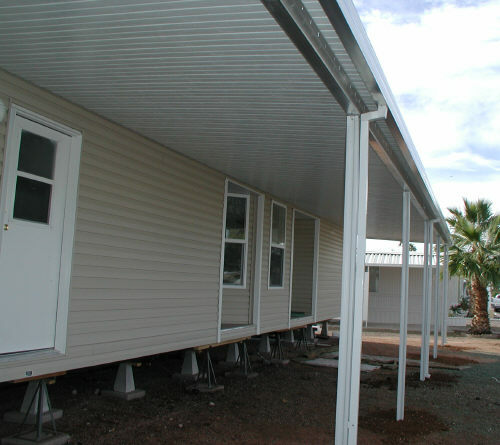 The most popular material for mobile home awnings is aluminum. Aluminum type awnings and patio covers are maintenance free and will stay an attractive addition to your home for many years. Much has been done in recent years to make aluminum awnings more attractive and stronger. When dealing with aluminum awnings make sure you work with a qualified contractor or do some home work about live loads, snow loads and panel gauge. These are some of the terms that will determine the strength of the awning. This information is found on the IBC reports that all awning manufactures should have for their awnings. These reports are also required by cities and counties requesting permits. 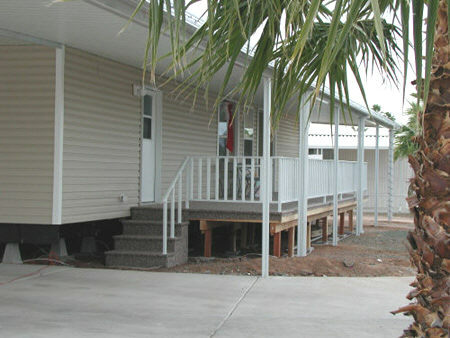 These are pictures of a mobile home we worked on. We started with the awnings, a patio cover and a carport cover. Under the patio cover we installed a deck and under the carport cover we installed a shed. 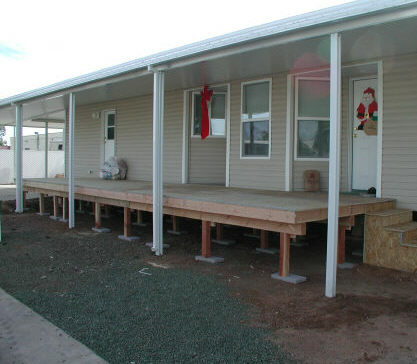 The finishing touches will be to continue the vinyl siding to the ground around the mobile home and deck. In this section we will cover different styles of aluminum patio covers, Alumawood solid and Alumawood lattice type covers. We will also get into the many uses for the area underneath your awning, like sheds, decks, screen rooms and Arizona rooms. Travel Trailer Awnings - Canvas rollups for your travel trailer or RV. 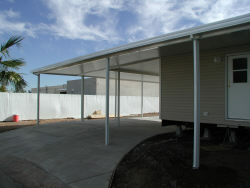 Awning Structures - A look at decks, sheds, shades and rooms. Alumawood Patio Cover - Pictures of the completed Alumawood project. Aluminum Awning Photos - Different types and uses for aluminum awnings. Screen Room Parts - See a screen room being built on a mobile home. 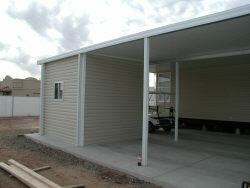 Obtaining a quote for a mobile home awning is easy, just use the contact form. 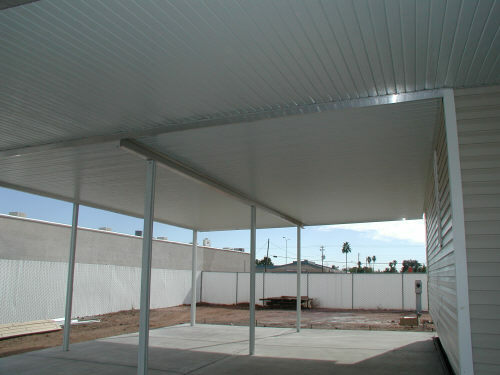 We cover the entire state of Arizona with quality awning installations.